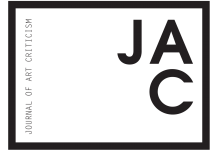 Journal of Art Criticism | JAC. Friedel, Can You Hear Me? Pinup (2017) Mixed media collage By Jasmine Weber, Columbia University Originally published in the 2018 print edition. Input Output I and Input Output II (2017) Digital embroidery on linen By Ella Viscardi, Barnard College Originally published in the 2018 print edition. Surface I (2016) 16mm film, hand processed and transferred to video Sound by Cami Dominguez and Zoe Biggers By Cami Dominguez, Amherst College Originally published in the 2018 print edition.